For April Fools’ Day, Call of Duty turned its players into literal trash. And now fans are begging to become garbage again. 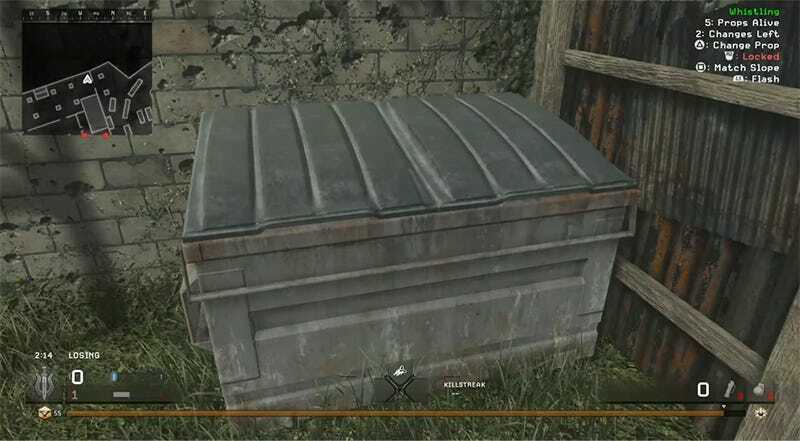 Over the weekend, Call of Duty: Modern Warfare Remastered, the upgraded version of the 2007 game packed in with some editions of last year’s Infinite Warfare, introduced a game mode called “Prop Hunt.” Based on a popular game mode in Garry’s Mod, Prop Hunt lets one team disguise themselves as props on a map—cardboard boxes, dumpsters, trash cans—and tasks the other team with finding them. Folks, it was the most fun I’ve had with Call of Duty in years. And I’m not alone. Over 50 percent of the game’s active player base joined the “Weekend Warfare” to try out this mode, and they’re asking Activision and developer Raven Software to make it a permanent addition to the game. Prop Hunt, as executed in Modern Warfare was a six-versus-six match. The team on offense had 3:30 to discover and kill the prop players. This garbage can has a good killstreak goin. The players on the prop team only received 30 seconds to blend into the map’s scenery before the hunt began. However, prop players weren’t left completely defenseless. They could change their prop twice during the match, and were armed with flashbang grenades that could temporarily incapacitate the hunters. The hunters were tasked with eliminating all prop players to win the round, and the prop team achieved the win if at least one player remained incognito until the time ran out. Fans have already tweeted to Raven Software in hopes of seeing Prop Hunt added to the permanent playlist. When popular YouTube personality Ali-A tweeted in favor of keeping the mode,the tweet gathered over 14,000 Likes. If Prop Hunt returns, I highly recommend giving the mode a test drive. You’ll giggle like mad as the opposing team circles you, completely unaware you’re a tree. As the hunting team, paranoia will set in as you realize you never really paid attention to how many trees are supposed to exist on the map. You know you’re being watched, and you’ll likely do a double take around each corner. Did that dumpster just move?